I’ve just finished up a Director Placement on ABC ME’s Mustangs FC with Roger Hodgman who’s directed TV shows like Secret Life of Us, Blue Heelers, City Homicide and recent episodes of Wentworth. “Mustangs FC is a goal kicking comedy drama about girls who are abandoning the sidelines and starting their local football club’s first all-female team”. It airs here in Australia on ABC ME and on CBBC in the UK and Universal Kids in the US. My placement was seven weeks including pre-production, shooting and a week of editing. It’s given me a fantastic insight into the Australian television industry and I was grateful to be a part of a production that was over 60% female! I think that statistic is pretty rare anywhere around the world. Roger, with all of his experience, was a very generous mentor and I learned so much from him. He’s a well respected industry director and someone who has worked with so many Australian actors, also being a previous artistic director of the Melbourne Theatre Company for over 10 years. Thanks to Roger, Matchbox Pictures & Film Victoria for having me on board. 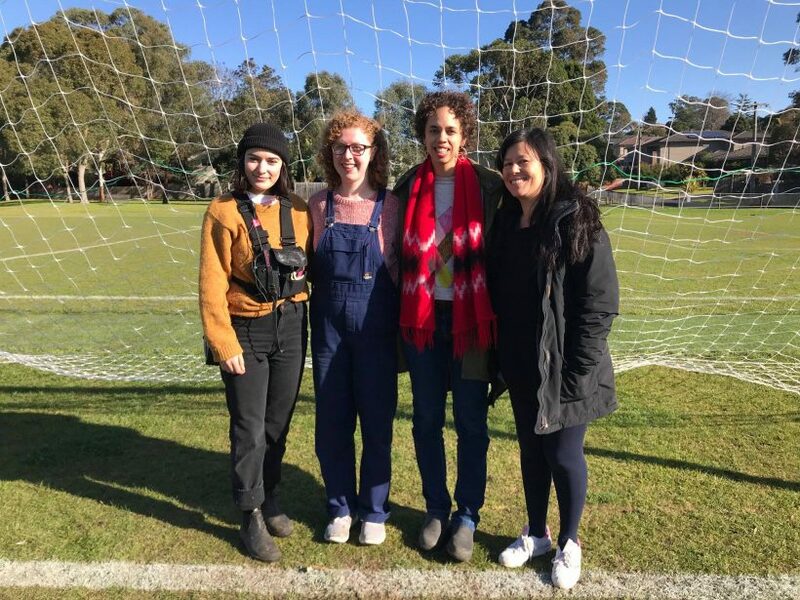 Also it was great to meet the other Film Vic attachments on set (pictured above): L-R, Writer Placement – Marisa Nathar; Director Placement – Amie Batalibasi; Camera Attachment – Bonita Carzino; Art Dept Attachment – Maddison Haywood.